Feb. 3 was a day for memories, emotion and a look toward the future for Adas Kodesch Shel Emeth of Wilmington, Del. The synagogue, which follows an Orthodox liturgy with mixed seating, staged a farewell ceremony to its Percival Goodman-designed house of worship, which has stood on Washington Boulevard since 1963. Goodman was a noted synagogue designer. Those attending the ceremony heard a short history of 134-year-old AKSE, reminiscences from congregants and remarks by Rabbi Steven Saks, Rabbi Emeritus Peter Grumbacher of Congregation Beth Emeth and congregation President Alan Bleier. Also featured were musical selections by Cantor Yehoshua Redfern and the synagogue’s High Holiday Choir. The Torah scrolls were then removed from the ark and carried in procession by those who have read Torah for the congregation. Several months ago, AKSE’s board and congregants decided, with a synagogue population that had dwindled from more than 500 families to about 200 over the last few decades, to sell the building to the New Mt. Olive Church Baptist Church, which will move from North Market Street in the city. The sale’s closing is tentatively set for March 4. AKSE’s last Shabbat services in the building will take place on Feb. 8 and 9. 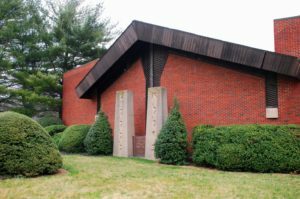 After that, the congregation will accept an offer from Conservative Congregation Beth Shalom and share space beginning Feb. 11 with a weekday minyan. Saks went through a similar transition before in the Greater Philadelphia area. He served at Conservative Adath Zion Congregation in Northeast Philadelphia, which merged with Congregation Ner Zedek-Ezrath Israel-Beth Uziel in 2013. The Ner Zedek group became part of the Congregations of Shaare Shamayim in Northeast Philadelphia in 2017. Saks came to AKSE in 2008. “This is not a merger, but a sharing agreement,” he said. “We’ll have our own offices and place of worship, our classes. You always do the best you can for your congregants. AKSE President Alan Bleier knows both synagogues well. He maintained membership at Congregation Beth Shalom for years, coming to AKSE when his father died in 2013. Beth Shalom President Jodie Pezzner is pleased with bringing AKSE under her synagogue’s roof. The two groups will each have theirs own place of worship. Beth Shalom has a membership of more than 400 families. Pezzner mentioned another benefit of having both congregations in one house. “If one or the other minyans is short one or two, and a congregant of either synagogue needs to say the Kaddish, we’ll never have a numbers problem with both there,” she said. There are facilities both can take advantage of, such as Beth Shalom’s certified-kosher kitchen, which allows for Shabbat lunches or meals with other functions prepared according to dietary requirements. AKSE’s clergy has worked closely with that body. Where the synagogues differ is in approach to worship. While Beth Shalom is an egalitarian Conservative institution with membership in the United Synagogue of Conservative Judaism, AKSE, on the other hand, follows the Orthodox davening structure. As Saks mentioned, all options are on the table for AKSE. The arrangement with Beth Shalom will last a year.